It's no secret that Child of Light was highly anticipated by me and the rest of the gaming world. Even before the game was released, many were enticed by it's beautiful visuals and Ubisoft's promise of a J-RPG like game inspired by J-RPGs such as the heralded the Final Fantasy VI. Not only that, but this was all offered at the low price of $19.95 (Australian). I am pleased to say that this is a worthwhile endeavour for any fan of the RPG genre and is an absolute delight to play. 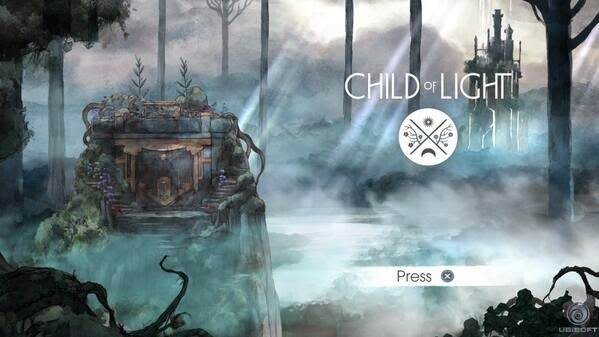 Noticeable from the moment you begin playing Child of Light is the overall feeling of the game. Echoed in every element of the game, such as the distinct watercolour visuals, dialogue and music, is the feeling of a lost child trying to find her way home. The colour scheme displays hints of vibrant colours with sullen earth tones and pure whites; the music (by the highly talented French singer/songwriter Coeur de Pirate) is soft yet heroic - the fact that this feeling is so evident throughout every part of the game gives the player an overall feeling of immersion inside the world of Lumeria. Also giving child-like joy to the player are the treasure chests and items that blend seamlessly into the 2D world. These pleasant surprises strayed me away from the straight and narrow path, happily making me want to explore and fly around the world until I had seen everything there was to see. The story of Child of Light is delivered in a rhyme format, reminiscent of Shakespeare's works or poems that you may have read as a child. As a songwriter, I particularly enjoyed these elements - I found myself actively trying to guess each rhyme before it happened. I can see the rhyme element being a hit and miss for some people, with certain pieces of dialogue occasionally seeming forced. In saying that, personally I felt the continued rhyming was relevant to maintain the games feel. I particularly enjoy the characters in the game - Aurora with her growing will, Rubella - whose rhymes are humourously corrected by the other characters and Igniculus, your bright little partner who can also be controlled by a friend with the use of a second controller. On the topic of Igniculus, I enjoyed being able to control him with the touch pad intergration on PS4's Dualshock 4, although it did take some getting used to. My first few attempts of using this functionality involved me accidentally bumming the little ball of light to the other side of the screen, but once you get the hang of it using touch pad (as opposed to the right analog stick) becomes rather intuitive. 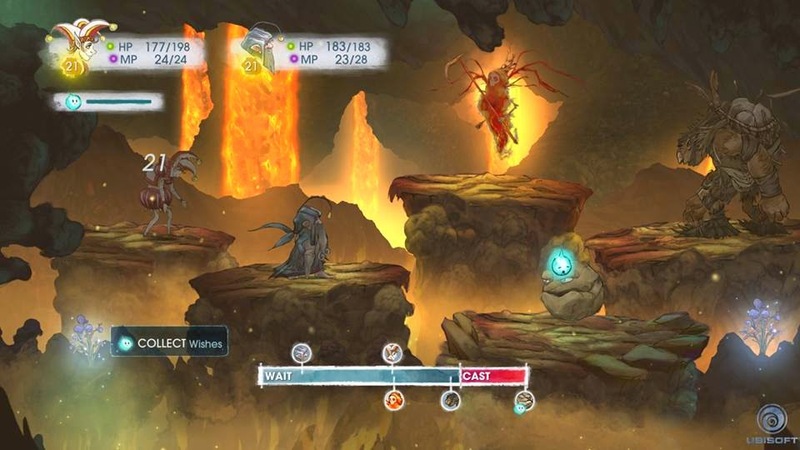 What I have enjoyed most in my hours playing Child of Light is the combat system. There is a bar at the bottom of the screen throughout battle (pictured). When the characters hit the end of the bar (after passing through the red 'cast' section), they are allowed to issue their command. However, if another character (yourself or an enemy) hits this point before you and attacks you while you are in the red zone, you are 'interrupted' and your attack becomes delayed. This is EXTREMELY fun - it always feels like a race to get my commands out before the opponent and makes me want to avoid being attacked as much as possible. This combined with the typical J-RPG weakness system (Water is weak against fire, etc.) and easily switchable characters that all excel in certain areas of combat (including healing, magic, status effects), the battle system is a rewarding experience for players playing on any difficulty. Even only about halfway through this game, my initial impressions of Child of Light are that this wonderful game is a long awaited breath of fresh air to the RPG genre with it's innocent feel, inviting exploration and it's ingeniously tactical battle system. It is the first game in months I have the feeling I will happily replay and I frankly can't wait for my next session of flying around inside the wonderful game of Child of Light.